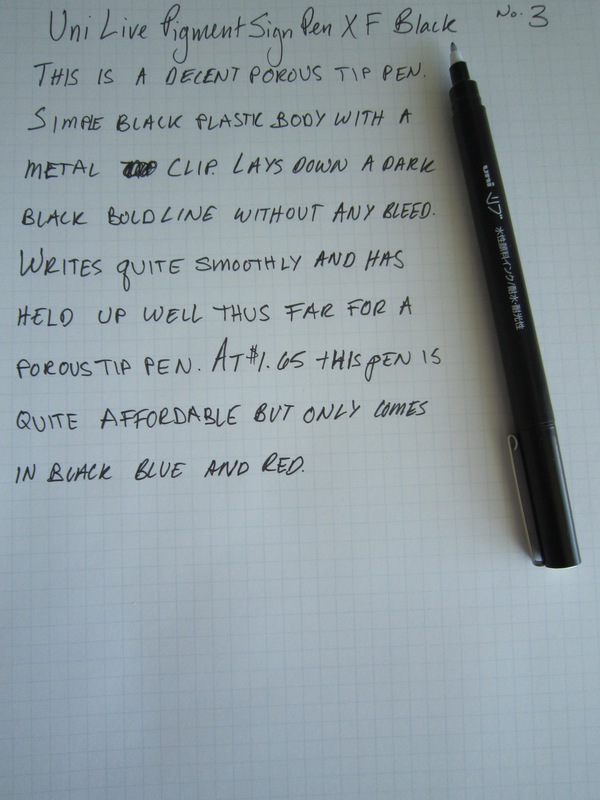 The Uni Live Pigment Sign Pen is a decent porous tip pen with a simple black plastic body and a metal clip on the cap. The pen puts down a nice bold black line, darker than that of the Stabilo Sensor I reviewed yesterday. This pen writes relatively smooth but does not glide across the paper as easily as other porous tip pens like the Staedtler Triplus fineliner (review to come) and the Stabilo mentioned earlier. At $1.65 this pen is affordable but only comes in black, blue and red. I like the Uni Live but I don’t think it is a pen I will be rushing out to buy more of them any time soon.